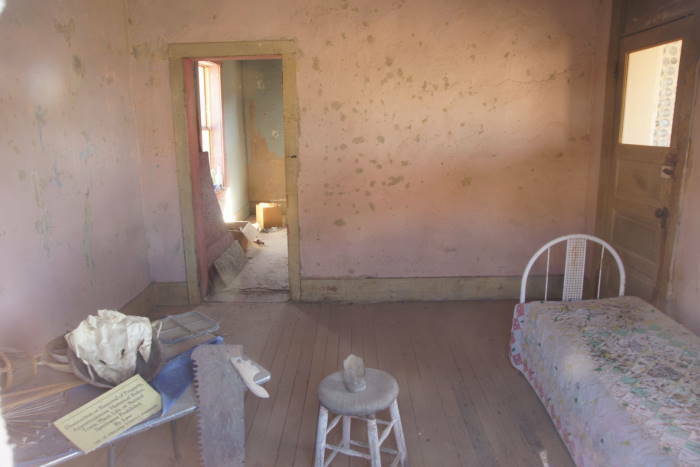 Just outside of Death Valley, on the Nevada side, you’ll find some excellent remnants of a once-booming town. You’ll also find a miner with a penguin and a tall, pixellated naked woman. It’s all part of the unusual combination of Rhyolite, a ghost town, and the Goldwell Open-air Museum — a collection of unusual outdoor artwork. I always enjoy wandering around a good ghost town, and Rhyolite is one of my favorites. Several of the buildings are still in good condition — just crumbled enough to make them interesting to photograph. … you’ll find Rhyolite’s old railroad depot. Construction on the building was complete in 1908. In less than ten years, the rails were gone (removed and recycled for the war effort) and the depot began decades of switching from one use to another — a private home, a boarding house, a gift shop, a church, and a casino among other things (according to the excellent rhyolitesite.com). Nowadays, the depot and the rest of the town is owned by the federal government. It’s held in a state of “arrested decay” — preserved only enough to keep it in its current state. Unfortunately, that means the building is off-limits to visitors, and surrounded by a high chain-link fence. It’s tough to get a good picture of the ornate old building because of all that fencing. Next to the depot, there’s an old railroad car that you can approach. … the most stately and distinctive building in Rhyolite is the old Cook Bank building. It looks almost the same as it did when I visited 11 years earlier. Back then, though, there were no fences surrounding the ruins, and you could climb up, and into, the old bank building and other structures (aside from the depot). Now, fences surround all of them, making them hard to photograph. There isn’t much to these fences — you could easily slip through them and explore up-close, but I wouldn’t recommend such behavior. The Cook Bank building was finished in 1908, and was the biggest building in town. If it looks familiar, it’s probably because you saw it on Ghost Adventures on the Travel Channel, or possibly in the 2005 film The Island. You can see the Cook Bank building through the windows of the next building down the road. This building isn’t surrounded by a fence, so you can walk inside for some close-up pictures. The wall extended up to a second story when I visited back in 2005. Sometime between then and now, that part of the wall collapsed. Some beautiful graffiti still remains. You really have to hand it to Bob — the cursive is impressive! Rhyolite’s old school is still in pretty good condition. It was completed in 1909 — at a time when the population was already starting to dwindle. This big of a schoolhouse was never really needed, but the rest of the building served other purposes for the town. 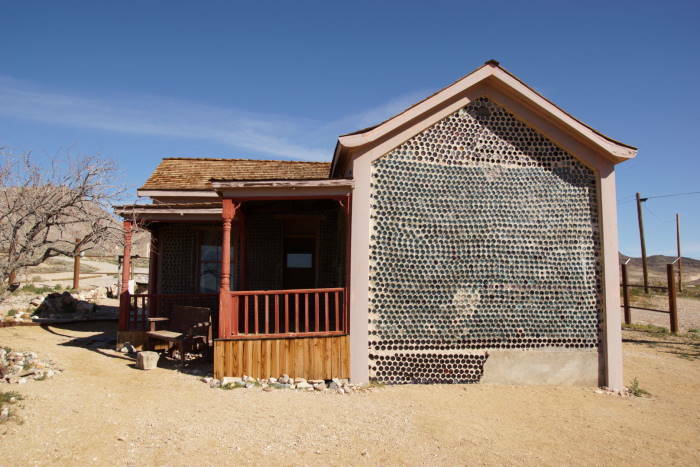 … it’s built out of bottles — nearly 30,000 of them, mostly Busch beer bottles from the local saloons (there was no shortage of used beer bottles in Rhyolite back in 1906, when the house was completed). 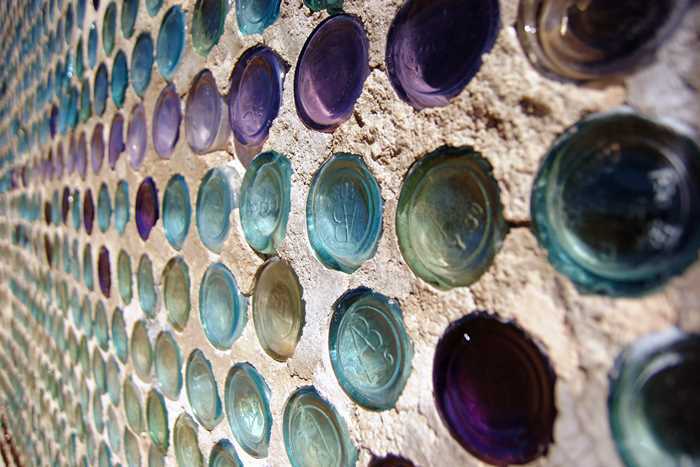 The bottle house received some rehab in 2005, shortly after I visited the last time. I thought the bottle house was open back then — but it’s not now. You can, however, peer into the windows, where everything looks untouched for the better part of a century. You’ll also find some hundred-year-old artifacts outside the Bottle House (essentially, Rhyolite’s trash 100 years ago, which has now become interesting archaeological finds). You can’t visit Rhyolite without also checking out the quirky Goldwell Open Air Museum. We’ll explore it on the next page.